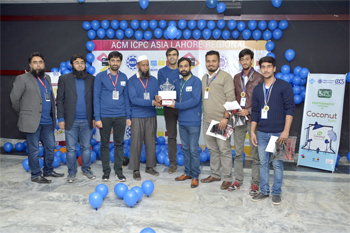 UMT hosted the ACM-ICPC Asia Lahore Regional Programming Contest at its campus. A total of 85 teams from Pakistan, Iran and India registered for the event while 44 teams participated in the finals on held on December31, 2017. The team Binary 01 from the Karachi Institute of Economics and Technology were declared the Asia Lahore Champion. This team will advance to world finals which will be held in China in April 2018. Nemesis from PUCIT was declared the first runner-up whereas Ghost's In wires from UMT was the 2nd runner-up. It is worth mentioning that the ACM International Collegiate Programming Contest (ICPC) is the premiere global programming competition conducted by and for the world’s universities, also known as the World Cup of Programming. 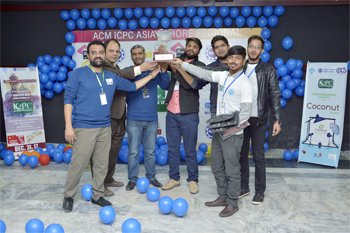 In 2017, a team from UMT won the ACM – ICPA Asia Lahore Regional Contest and became a world finalist. 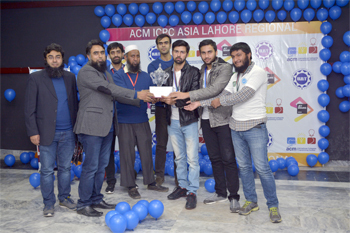 Nabeel Sabir Khan, Director, ACM-ICPC Pakistan, and Assistant Prof, School of Systems and Technology (SST) and coach of the UMT winning team, took special care to organize the event in the UMT Campus.